Bacitracin is a polypeptide antibiotic produced by organisms of the licheniformis group of Bacillus subtilis var Tracy. It is used to determine its effect of a small amount (0.04 IU or 0.05 IU not higher) on different microorganisms. 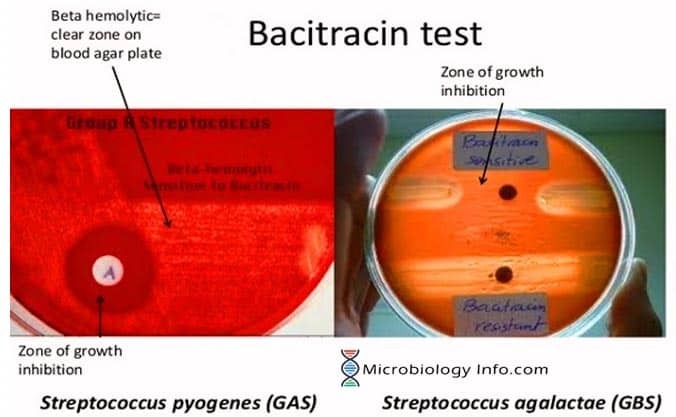 The presumptive identification of beta hemolytic Group A streptococci from beta hemolytic non-Group A Streptococci is usually done by testing for sensitivity to bacitracin. Many laboratories use this test as the sole test for diagnosing GAS infections due to the difficulty in performing sero-grouping and high cost of antisera. The test is used for presumptive identification and differentiation of beta-hemolytic group A streptococci (Streptococcus pyogenes– susceptible) from other beta-hemolytic streptococci. It is also used to distinguish staphylococci species (resistant) from micrococci (susceptible). The antibiotic bacitracin inhibits the synthesis of bacterial cell walls by interfering the peptidoglycan synthesis of bacteria. A disk impregnated with a small amount of bacitracin (0.04 units) is placed on an agar plate, allowing the antibiotic to diffuse into the medium and inhibit the growth of susceptible organisms. After incubation, the inoculated plates are examined for zones of inhibition surrounding the disks. If the organism grows up to the edge of the disk, it is resistant to the antimicrobial compound infusing the disk. If there is a zone around the edge of the disk where the organism has not grown, the organism is susceptible to the antimicrobial in the disk. Using an inoculating loop, streak two or three suspected colonies of a pure culture onto a blood agar plate. Using heated forceps, place a bacitracin disk in the first quadrant (area of heaviest growth). Gently tap the disk to ensure adequate contact with the agar surface. Incubate the plate for 18 to 24 hours at 35°-37°C in ambient air for staphylococci and in 5% to 10% carbon dioxide (CO2) for streptococci differentiation. Look for a zone of inhibition around the disk. Mostly, blood agar plate is used (trypticase soy agar + 5% sheep blood). Positive: Any zone of inhibition greater than 10 mm; susceptible. Performance depends on the integrity of the disk. Proper storage and expiration dates should be maintained. Culture media must be freshly prepared for optimum diffusion of the antibiotic. Lancefield groups C and G streptococci may occasionally also show susceptibility to bacitracin. When testing isolates, a light inoculum may result in false zone of inhibition.